The newly born rose plant stood in awe, gazing at the giant Angel Oak. The Oak was living for more than 1000 years. Rose: Did you grow this big in a year? Oak: I really didn't decide to grow this size. Rose: Then how did you become so huge? Can I become like you? Oak: Being an Angel Oak is what I was born for. You were born to be a Rose. If you grow this size no one will be able to appreciate you. Trying to become somebody else is the cause of all "problems" we face. 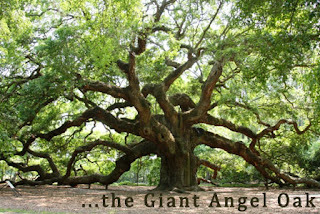 Facts: The Angel Oak is a native species found throughout the Lowcountry (Coastal Carolina,USA). It is believed to be in excess of 500(some say 1500) years old. The tree acquired the name from the tree's previous owners, Martha and Justin Angel.